In a galaxy far, far away a plot has developed and a civil war has begun. This is how the film begins. No opening crawl and immediately following that iconic phrase the action begins. It is relentless and it never stops. Having been a Star Wars fan since its premier almost 40 years ago I have to say this has to be the best one I have ever seen! What I enjoyed most about this film is, that as a spin-off, it is somewhat of a departure from the usual. Interesting as well as the fact that there were far more battle sequences without clear-cut villains and heroes. Set before the events of the original Star Wars Episode IV - A New Hope (1977) and following the formation of the Galactic Empire Star Wars Rebels (2014) it is a first in the Star Wars Anthology series. It is also the first live action "Star Wars" spin-off film to appear in U.S. theaters. In this installment, Mon Mothma of the Rebel Alliance recruits Jyn Erso (Felicity Jones) a rebellion soldier and criminal to work with a rogue team of resistance fighters that includes Cassian Andor (Diego Luna) and non-allied forces to steal the design schematics of the Empire's new super weapon, the Death Star. What ensues is epic. Alan Dudyk (Zootopia), who is no stranger to lending his voice for a myriad of characters, provides the reprogrammed Imperial droid K2SO with a very dry sense of humor, remarkable wit and spot-on sarcasm. With the aid of Director Gareth Edwards (Godzilla 2014) his presence is a welcomed addition to the overall scheme of things. 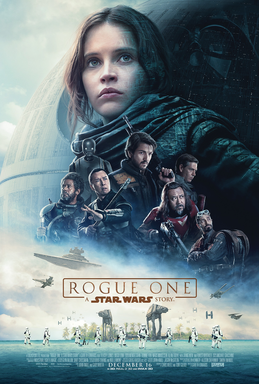 Director of photography Greig Fraser (Foxcatcher) and Special Effects Supervisor Neil Corbould (Gladiator) went above and beyond to present a lived-in realistic feel while writers Chris Weitz (2015s Cinderella) and Tony Gilroy (2012s Bourne Legacy) teamed up with George Lucas to provide the drama. The numerous impressive battle scenes staged within orbit and upon the surface of Outer Ring planet Scarif is visually striking. This is not your stereo typical Star Wars flick. What it lacks with light sabers and appearances by the characters we come to love is replaced by the unknown. For die-hard fans there are cameo appearances by C-3PO, R2-D2 and one other that I won’t mention. I will say, the force is definitely here to stay.